The 1831 eruption of Babuyan Claro in the Philippines is regarded as one of the most significant volcanic climate forcing events of the nineteenth century. Modern databases have assigned the eruption a VEI of 4? and Magnitude of 4.7. Our analysis of historical sources, however, suggests that there was no such eruption in 1831 and that this date is the result of a misinterpretation of a traveller’s account which had been taken to be the primary source. We therefore suggest that the 1831 eruption is a false event. In this case, one or more eruptions elsewhere must have been responsible for producing the climate-impacting stratospheric sulphate aerosol in 1831. Our results reveal the need to re-evaluate the hazard assessment of Babuyan Claro volcano and also, potentially, the quantitative treatment of the 1831 stratospheric sulphate aerosol in climate models. The Babuyan Claro example discussed in this paper therefore reinforces a call for the careful analysis of primary historical sources in volcanology. Volcanic eruptions that produce sulphate aerosols in the stratosphere are important climate forcing events (Robock 2000). A body of evidence points to such an eruption in 1831. Unusual atmospheric optical phenomena were observed around the world in August, September and October 1831, including a high haze, a dimmed blue or green sun and ‘volcanic’ sunsets (Arago 1832; Kiessling 1888; Symons 1888). When the Krakatoa Committee of the Royal Society of London was searching for analogous examples of the optical phenomena seen after the 1883 eruption of Krakatoa, in Indonesia, they identified those in 1831, along with those observed in 1783 after the Grímsvötn (Laki) eruption, in Iceland, as the two most similar to have been reported in the previous four centuries (Symons 1888). Anomalous surface temperatures (regionally warmer or cooler than normal) occurred between 1831 and 1833 (White et al. 1997; Shindell et al. 2004; Fischer et al. 2007; McCarroll et al. 2013). A sulphate peak detected in ice-cores from Greenland which is ranked as either the second (Zielinski et al. 1994), third (Sigl et al. 2013) or fifth (Gao et al. 2008) largest of the nineteenth century has been dated to 1831, with deposition continuing until 1833 (Sigl et al. 2013). Even if ranked fifth (Gao et al. 2008), the only larger nineteenth century peaks are those produced by the eruptions of Tambora (1815, Indonesia), Unknown (1809), Cosegüina (1835, Nicaragua) and Krakatoa. The largest magnitude eruption listed for 1831 in the standard catalogue of historical volcanism (the Smithsonian Global Volcanism Program (GVP) database) is that of Babuyan Claro, in the Philippines, with a Volcanic Explosivity Index (VEI) of ‘4?’ (GVP 2013). The question mark indicates a VEI value that was “particularly difficult to assign [or was] based on purely circumstantial evidence” (Simkin et al. 1981). A VEI ≥ 4 is associated with a ‘definite’ stratospheric injection of eruption products (Newhall and Self 1982). This eruption has therefore commonly been inferred to be the likely source of the 1831 stratospheric sulphate aerosol (Zielinski et al. 1994; White et al. 1997; Fischer et al. 2007; Sigl et al. 2013) and, given the magnitude of the associated Greenland sulphate peak, it is regarded as one of the most significant volcanic climate forcing events of the nineteenth century, particularly so when treated as a double eruption with the 1835 (VEI = 5) eruption of Cosegüina, producing ‘enhanced’ forcing effects over a decadal time frame (Zielinski 1995; Arfeuille et al. 2014; Longpré et al. 2014; Toohey & Sigl 2017). This eruption is also listed in the Large Magnitude Explosive Volcanic Eruptions (‘LaMEVE’) database (the threshold for inclusion in which is a VEI of at least 4), with a Magnitude (M) of 4.7 (Crosweller et al. 2012). 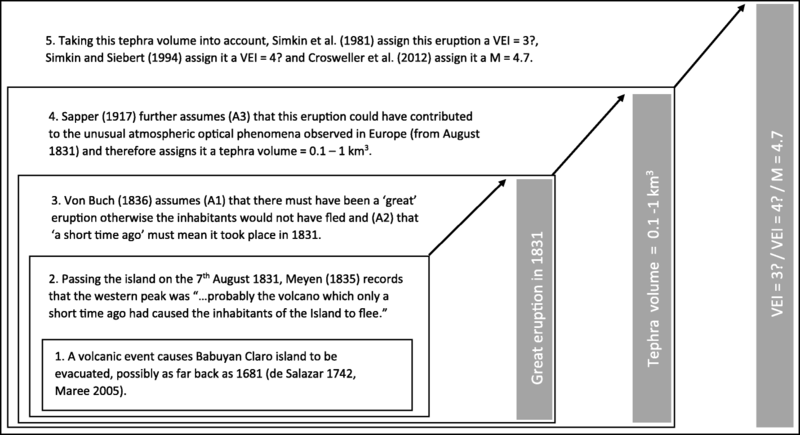 However, the record of the 1831 eruption of Babuyan Claro in the GVP database is based solely on historical observations (GVP 2013) and Zielinski (1995) has highlighted the need for the ‘thorough study’ of this ‘less well known’ eruption. 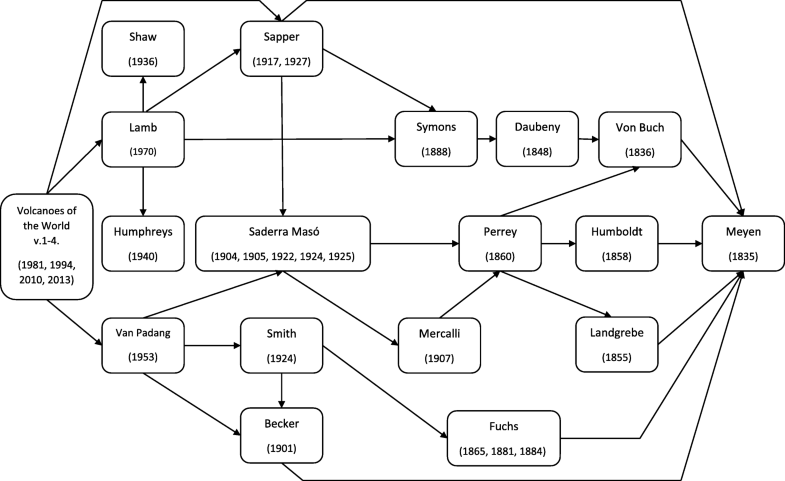 In this paper we identify and analyse the relevant historical observations to investigate if they are commensurate with the suggested VEI and Magnitude (Crosweller et al. 2012; GVP 2013). Our analysis shows that, to the contrary, there is no reason to believe that Babuyan Claro did erupt in 1831 and that its record in the present-day literature is the result of mistaken assumptions. We therefore suggest that the 1831 eruption of Babuyan Claro is a false event and that one or more alternative eruptions will have to be identified as the source of the 1831 stratospheric sulphate aerosol. Historical sources (typically written records) can generally be divided into two categories. ‘Primary’ sources provide first-hand evidence of a historical event, for example contemporaneous eye-witness statements. ‘Secondary’ sources later mention, discuss or interpret those primary sources. Primary sources are therefore of paramount importance in providing the evidentiary base for the secondary sources. Since the primary sources for the 1831 eruption of Babuyan Claro were not immediately identified in the GVP database (GVP 2013), we identified them according to the following method. An initial set of sources was selected from the references and bibliographies of the successive editions of the Volcanoes of the World (Simkin et al. 1981; Simkin and Siebert 1994; Siebert et al. 2010; GVP 2013). The earlier sources from which they drew their information were then identified by the multi-step process illustrated in Fig. 1. In some cases, an earlier source could be identified explicitly where cited with a complete reference. In other cases its identity could be inferred, for example, on the basis of a partial reference. The multi-step process was repeated iteratively for successively earlier sources, tracing several routes back through the literature, until the primary source(s) for the eruption had been obtained. A total of 39 sources were analysed for the 1831 eruption of Babuyan Claro (written in English, French, German and Italian), as well as two supplementary sources from before 1831 that mention Babuyan Claro island (written in English and Spanish). These included the standard catalogues of historical volcanism by von Hoff (1841), Daubeny (1848), Landgrebe (1855), Scrope (1862), Fuchs (1865), von Humboldt (1869), Mercalli (1907), Schneider (1911), Sapper (1917, 1927), Catalogue of the Active Volcanoes of the World (CAVW) (1951–1975) [Part II: Philippine Islands and Cochin China (van Padang 1953)] and Macdonald (1972). Table 1 contains an entry for each source including (i) textual extracts along with translations into English where necessary; (ii) a classification as to primary (‘P’) or secondary (‘S’) source type where appropriate; and (iii) in the case of secondary sources, a list of the earlier sources (if any could be identified) on which they were based. N.B When viewing the eruptive history of Babuyan Claro volcano through the ‘Volcano Search’ option of the GVP database, a VEI = 4 (without the question mark modifier) is presented. However this is seemingly an artefact of the web interface and the VEI = 4? presented in the authoritative Holocene spreadsheet data downloadable from the GVP database is the correct value (pers. comm. Dr. Ben Andrews, Smithsonian Institution, 28/04/2016). Various late C19th and C20th sources including Van Padang (1953), Saderra Masó (1924), Smith (1924), Saderra Masó (1904). N.B. No reference to an 1831 eruption of Babuyan Claro. 5. Babuyan Claro, 1000 m, in 19o 40’ N. Br., 121o 56′ Ö.L., hatte 1831 heftigen A., dessen Feinaschen in Europa Dämmerungserscheinungen verursacht haben dürften (neuerdings bezweifelt). Tätig um 1860. 1917 und 1918 Anzeichen neuer Tätigkeit. “5. Babuyan Claro, 1000 m,...underwent a powerful eruption in 1831, whose fine ashes could have caused the twilight effects in Europe (recently questioned). N.B. It is interesting that Sapper introduces the phrase ‘recently questioned’ to his 1927 entry for this eruption. He cites only Saderra Masó (1922), the summary of which presented in Saderra Masó (1925) states that a precise knowledge of the dates of historical eruptions of Babuyan Claro volcano is ‘rather wanting’. However, even if Sapper did entertain any such doubts in 1927, there is no evidence to suggest that they constrained the use of his 1917 tephra volume range by later authors. N.B. It is interesting that, consistent with Maree (2005), Smith became aware on his brief visit to Babuyan Claro island that it had been uninhabited till comparatively recently (although he seems to have been unaware that it had been previously inhabited in the more distant past). “Babuyan Claro, 1000 m, hatte 1831 (5) einen heftigen Ausbruch, dessen Feinaschen noch in Europa schöne Dämmerungserscheinungen mitverursacht haben dürften (6). (5) Masó a) S. 12. Meyen, Reise II, S. 181. [Translation: “Babuyan Claro, 1000 m, underwent a powerful eruption in 1831 (5) the fine ashes of which could have contributed to the beautiful twilight effects even in Europe (6). (5) Masó a) P. 12. Meyen, Reise II, P. 181. N.B. An earlier reference (p. 148) makes clear that the first reference is to Saderra Masó (1904). “(3) Landgrebe, l.c., p. 348, d’après Meyen, Reise um die Erde, t. II, p. 184. De Buch, l.c., p. 438, même source. “(3) Landgrebe, l.c., p. 348, according to Meyen, Reise um die Erde, v. II, p. 184. De Buch, l.c., p. 438, same source. N.B. The reference to v. 2, p. 184 of Meyen (1835) is evidently a mistaken reference to p. 181. It is interesting to note the degree of embellishment which has been introduced here: not only did the inhabitants have to flee the island but they had to do so ‘as quickly as possible’. N.B. No reference to an 1831 eruption of Babuyan Claro (although at v.2, p. 182, von Hoff does refer to Meyen’s ‘Reise um die Welt [sic]’). A solar halo known as a ‘Bishop’s Ring’ is sometimes observed after a volcanic eruption (Meinel and Meinel 1983). Caused by the diffraction of sunlight by volcanogenic aerosol particles, it typically appears as a brighter whitish-blue disc surrounding the sun, enclosed by a dimmer reddish-brown ring: the inner and outer radius of the ring varies by several degrees depending on the particular size distribution of the aerosol but average values are c. 10-11o and 22-23o respectively (Symons 1888; Meinel and Meinel 1983). Meyen’s description seems, however, a closer match to a more common 22o solar halo. Caused by the refraction of sunlight (or moonlight) by atmospheric ice-crystals, this appears as a brighter rainbow-like arc around a dimmer portion enclosing the sun, with a well defined reddish inner radius at 21.7o extending outward to a more diffuse bluish-white edge (Lynch and Livingston 2001). The circumscribed 22o solar halo which is observed at high solar elevations is particularly pronounced (Können 2015). The extended twilight appears to be an observation of the unusual atmospheric optical phenomena being contemporaneously observed elsewhere in the world at the time (as mentioned in the Introduction) but is therefore not local to Babuyan Claro island or even to East Asia (Arago 1832; Kiessling 1888; Symons 1888). Figure 2 shows the network of routes traced back through the sources for the 1831 eruption of Babuyan Claro. A striking feature is that they all lead to Meyen (1835) as the primary source. In 1835, Franz Julius Ferdinand Meyen (b. 1804, d. 1840) published ‘Reise Um Die Erde’ (Voyage Round the World), an account of his round-the-world voyage (1830–1832) aboard the Prinzess Louise (Meyen 1835; CDSB 2008). He had previously trained as a surgeon and published an important work in the field of botany (Meyen 1830; CDSB 2008). In July 1831 the Prinzess Louise left the Hawaiian islands for China. 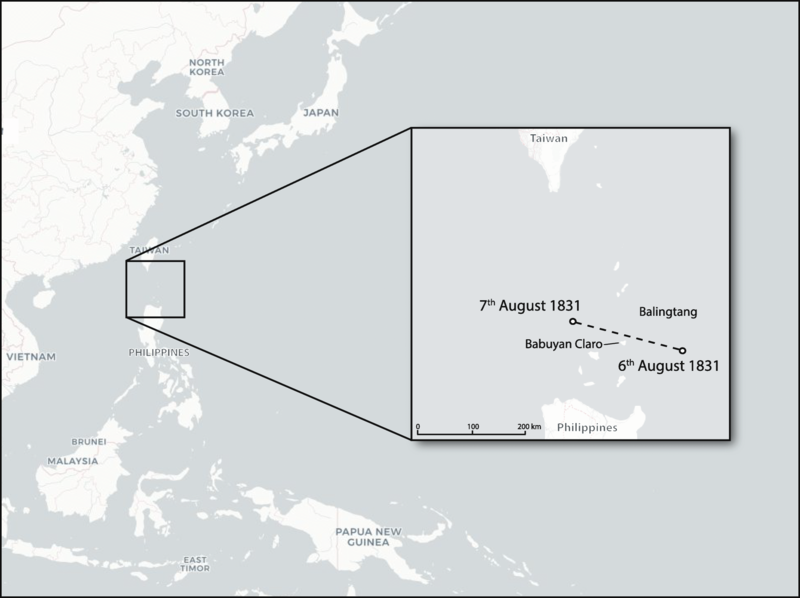 The ship passed the remote island of Babuyan Claro whilst traversing the channel between the Philippines and Taiwan (Fig. 3). The island forms a part of the Luzon volcanic arc (Defant et al. 1990) and has two active volcanoes: the stratovolcano Babuyan Claro, which rises to 1080 m. a.s.l. at the centre of the island, and Smith volcano, a smaller cone at the western end of the island with a peak at 688 m. a.s.l. (GVP 2013) (Fig. 4). On page 181 of volume 2 of his account, Meyen records that: “…We chose to approach through the Balingtang Straits and, on the following morning [7th August 1831], had the Island of Babuyan in view on the left and the Island of Balingtang on the right. The mountains of Babuyan could exceed a few thousand feet in height, their western peak forming a steep cone, which is probably the volcano which only a short time ago had caused the inhabitants of the Island to flee. Balingtang island has some strangely shaped rocks in its vicinity…” (Meyen 1835, italics added; Table 1). The western peak is Smith volcano. The italicised sentence is Meyen’s only reference to a volcano on Babuyan Claro island in his whole account. Assuming a straight line between the ship positions that Meyen noted in his meteorological log for 12 h on the 6th August and 18 h on the 7th August (Meyen 1835), Fig. 3 shows the re-constructed course of the Prinzess Louise. The reconstruction suggests that Meyen would still have been about 14 km distant at his closest approach. 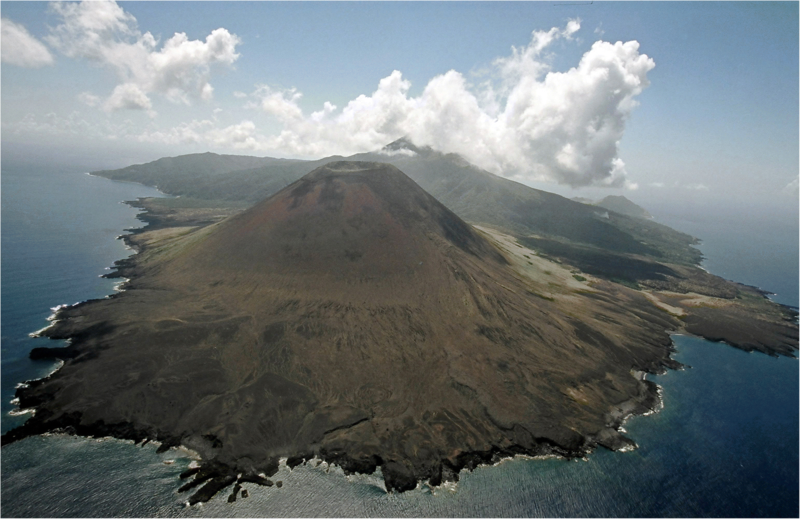 Meyen evidently believed (a) that a volcanic event had taken place on the island, ‘probably’ at Smith volcano; (b) that it had caused the inhabitants of the island to flee; and (c) that it had occurred ‘only a short time ago’. However, his use of the term ‘probably’ indicates that he could not have observed any unambiguous evidence of a recent eruption. Prior to his passage past the island, his account contains no record of any of the phenomena, such as cannon-like booms, smoke columns or ash fall, which might have evidenced an eruption nearby (although, coincidentally, it appears that he did observe at least one of the unusual atmospheric optical phenomena which were being seen around the world at the same time, see Meyen 1835; Table 1). His account includes no record of having met any of the fleeing inhabitants or, indeed, of having met anyone else who had done so. His use of the phrase ‘only a short time ago’ is difficult to interpret because elsewhere in his account he uses similar phrases to indicate intervals from hours to decades, depending on the context (Meyen 1835). Meyen’s (1835) account therefore provides no suggestion that he was reporting a volcanic event which he had witnessed himself. Rather, it is more likely that he was reporting one which he had read about (or otherwise become aware of) from an unacknowledged source describing an earlier event which had driven the inhabitants of the island to flee. We have identified evidence pointing to at least one such event. The eighteenth century historian Vicente de Salazar reported that, in 1681, a volcano on top of a high mountain on Babuyan Claro island threw out ‘fire, rocks and ash’ and produced a ‘huge boom’ (de Salazar 1742; Table 1). Although this description points to a comparatively modest eruption, de Salazar (1742; Table 1) further reported that Fr. Matheo Gonçalez, a Dominican priest visiting the island at the time, drew a vivid comparison for the inhabitants between the observed phenomena and the torments of those condemned to Hell, whereupon they all decided to return with the priest to the mainland in order to remain in communion with the Church. Whether this is a wholly objective account is unclear. Based on the historical and genealogical research that she has conducted with the Ibatan people living on Babuyan Claro, Maree (2005) also suggests that the 1681 eruption led to the depopulation of the island and that it remained uninhabited thereafter until the second half of the nineteenth century. Additional research will be necessary to investigate this evidence further. Clearly, it would seem doubtful that Meyen (1835) would knowingly have considered a span of 150 years to be ‘only a short time ago’ but whether the unacknowledged source from which he gleaned his information reliably represented the date of the event described is as yet unknown. 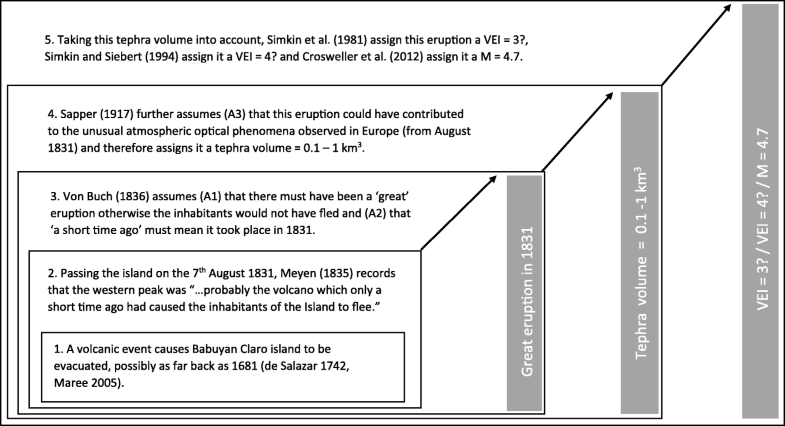 For present purposes, it can be concluded that Meyen’s (1835) account does not represent a primary source and cannot provide any evidence for an eruption of either volcano on Babuyan Claro island in 1831. If this is the case, the question arises as to how an 1831 eruption of Babuyan Claro came to appear in the later literature and, in particular, how it came to be represented with a VEI of 4? and Magnitude of 4.7 (Crosweller et al. 2012; GVP 2013). Inverting the set of routes from the present day back to Meyen (1835) (Fig. 2) suggests several possible pathways from 1831 forward to the present day. In fact, the present day representation of the 1831 eruption can plausibly be explained taking into account the steps taken by just two authors. Leopold von Buch published an eruption catalogue in 1836, one year after the publication of Meyen (1835). He included the following entry: “Volcano on the island of Babujan [sic]...This volcano, which is some several thousand feet high, is located at the western end of the island. A great eruption, which took place in 1831, forced the inhabitants to take flight and abandon the island (Meyen, Voyage, II, 181).” (Von Buch 1836; Table 1). Meyen’s 1835 account is the only source that Von Buch cites to support this entry and yet the two are markedly different. Von Buch evidently regarded the passage as pointing to a volcanic eruption and seems to have made the following implicit assumptions: (A1) that it must have been a ‘great’ eruption, otherwise the inhabitants would not have fled; and (A2) that ‘a short time ago’ must arbitrarily mean it took place in 1831. Von Buch’s (1836) catalogue was influential and, based on this interpretation of Meyen’s account, an entry for a fictitious ‘great’ eruption on Babuyan Claro island in 1831 was widely included in the subsequent literature. Karl Sapper published an eruption catalogue in 1917. When he was satisfied there was sufficient evidence, Sapper categorised a number of historical eruptions by their products (lava and/or tephra) and their volume (> 0.1 km3 and > 1 km3). Sapper also cited Meyen’s 1835 account but, reflecting Von Buch’s interpretation, he took the existence of a ‘great’ (or ‘powerful’) eruption of ‘Babuyan Claro’ in 1831 as a fact (Sapper 1917; Table 1). On the basis of his reading of the Report of the Krakatoa Committee of the Royal Society (Symons 1888), however, he took a further step. Part IV, section V of that Report presents a list of observations of unusual atmospheric optical phenomena over the period 1500–1886, accompanied by a list of historical eruptions. In the case of 1831, alongside the unusual atmospheric optical phenomena seen in August, September and October 1831, six eruptions were listed including that of Babuyan Claro (“Babujan Islands (Great eruption)”) (Symons 1888). The Report did not explicitly discuss the attribution of the phenomena to one eruption or another. Sapper, however, explicitly stated a further assumption (A3) that the eruption of Babuyan Claro could have contributed to the unusual atmospheric optical phenomena observed in Europe (in August, September and October 1831) (Sapper 1917; Table 1) on the basis of which he assigned it a commensurate tephra volume of 0.1 to 1 km3 (Sapper 1917, Table 1). This volume estimate has been widely used in subsequent quantitative treatments of the eruption. For example, erupted volume (lava and/or tephra) is a key determinant in assigning a value for the Volcanic Explosivity Index (VEI): volumes of 0.01 to 0.1 km3 are correlated with a VEI of 3 and 0.1 to 1 km3 with a VEI of 4 (Newhall and Self 1982). Sapper’s (1917) volumes were used to assign VEI values, although they were treated as ‘rough estimates’ and were not mechanistically mapped: a number of early nineteenth century eruptions to which Sapper had assigned a 0.1–1 km3 volume have been variously assigned VEI values of 3, 3? and 4 (Simkin et al. 1981; Newhall and Self 1982). The 1831 event was initially treated as an eruption of Smith volcano and assigned a VEI = 3? (Simkin et al. 1981). It was subsequently reclassified as an eruption of Babuyan Claro volcano (COMVOL 1981; Simkin and Siebert 1994) with a VEI of 4? (Simkin and Siebert 1994), bringing the value into line with Sapper’s 0.1–1 km3 volume estimate and assigning to Babuyan Claro the largest VEI value of any eruption listed in 1831. It is noteworthy that the reclassification was contemporary with Zielinski et al.’s (1994) identification of this eruption as the source of the large magnitude Greenland sulphate peak. A VEI of 4? continues to be cited in the GVP database (GVP 2013, although see the accompanying note in Table 1). The LaMEVE database lists a Magnitude of 4.7 for this eruption, which is consistent with taking the mid-point of Sapper’s 0.1–1 km3 volume and using a default tephra density of 1000 kg m− 3 to obtain a mass of 5 × 1011 kg (Crosweller et al. 2012). The VEI of 4? and Magnitude of 4.7 (Crosweller et al. 2012; GVP 2013) are therefore essentially re-statements of Sapper’s (1917) 0.1–1 km3 estimate for tephra volume. Our analysis shows that there is no reason to believe that there was an 1831 eruption of Babuyan Claro. Although Meyen’s (1835) account has long been treated as the single primary source for an 1831 eruption of Babuyan Claro, in fact it provides no evidence of any such eruption and, indeed, it is possible that it mistakenly refers to an event as far back as 1681. The records of such an eruption in the present-day literature can be explained as the result of Von Buch’s (1836) and Sapper’s (1917) mistaken assumptions about this account. These results are summarised in Fig. 5. We therefore suggest that the 1831 eruption of Babuyan Claro is a false event and that the records of it in the present-day literature are erroneous, including the VEI of 4? listed in the GVP database (GVP 2013) and the Magnitude of 4.7 listed in the LaMEVE database (Crosweller et al. 2012). Discounting the 1831 eruption, the remaining historical eruptions of volcanoes on Babuyan Claro island listed in the GVP database comprise, for Babuyan Claro volcano, 1860 (VEI = 2) and 1913 (VEI =2, uncertain) and for Smith volcano, 1652 (VEI =3) and 1907–1924 (five eruptions, all VEI = 2) (GVP 2013). The modest eruption reported by de Salazar (1742) in 1681 is not listed. In the absence of a historical eruption with a VEI ≥ 4, Babuyan Claro might not be as violently explosive as previously thought: it may thus have a lower potential for triggering tsunamigenic hazards (Paris et al. 2014) and its inclusion in the LaMEVE database will no longer be warranted. Neither will there be any evidence to suggest that Babuyan Claro appears to form ‘part of a high sulphur producing system’ (Zielinski 2000). The mis-identification of an eruption of Babuyan Claro as the source of the 1831 stratospheric sulphate aerosol will have hidden its actual source: at least one alternative eruption will have instead produced the Krakatoa-like unusual atmospheric optical phenomena observed around the world in August, September and October 1831 (Arago 1832; Kiessling 1888; Symons 1888), the surface temperature anomalies which occurred between 1831 and 1833 (White et al. 1997; Shindell et al. 2004; Fischer et al. 2007; McCarroll et al. 2013) and the large magnitude Greenland sulphate peak deposited during 1831–1833 (Zielinski et al. 1994; Gao et al. 2008; Sigl et al. 2013). A small magnitude sulphate peak resulting from deposition during 1831–1833 has also been reported in ice-cores from Antarctica (Sigl et al. 2013). Although the detection of near synchronous (within c. 1 year) sulphate peaks in both Greenland and Antarctic ice-cores suggests a single low-latitude (tropical) eruption, as was thought to be the case with Babuyan Claro, another possibility is that the sulphate peaks are the result of independent eruptions higher in the northern and southern hemispheres (Sigl et al. 2013). It has been suggested, for example, that the timing of the Antarctic sulphate peak instead likely points to a local Antarctic eruption in 1833 (Crowley and Unterman 2013). The alternative source of the Greenland sulphate peak could therefore be located at a mid- or high- latitude site in the northern hemisphere. If Babuyan Claro is discounted, the next largest magnitude eruptions listed for 1831 have a VEI of 3 (GVP 2013): Campi Flegrei Mar Sicilia, off the south coast of Sicily (37.1o N.) (also known as Ferdinandea, Giulia (Julia) and Graham Island); Guagua Pichincha, Ecuador (0.1o S.); and Mount St. Helens, U.S.A. (46.2o N.). A VEI of 3 is associated with only a ‘possible’ stratospheric injection of eruption products (Newhall and Self 1982) but this is more likely to happen at a mid- or high- latitude site than a low latitude site given the decrease in height of the tropopause from c. 15–17 km at the equator to c. 8–9 km at the poles: it has been estimated, for example, that the columns of some 23% of eruptions at mid- or high- latitude sites with a VEI of 3 may penetrate the tropopause (Pyle et al. 1996). Whether one of these known 1831 eruptions could be the source of the Greenland sulphate peak or whether an as yet unknown eruption is responsible is the subject of continuing work. Although a detailed discussion is beyond the scope of this paper, a change of source eruption for the Greenland sulphate peak from one at a low-latitude site to one at a mid- or high- latitude site in the northern hemisphere could have quantitative consequences for the correct representation of the 1831 stratospheric sulphate aerosol in climate models. The mass (and therefore the forcing effect) of the 1831 stratospheric sulphate aerosol is typically reconstructed by ‘scaling up’ the magnitude of the Greenland sulphate peak (Zielinski 1995; Gao et al. 2008; Arfeuille et al. 2014; Toohey and Sigl 2017). The choice of ‘scaling factor’ depends on the geographical location (latitude) of the assumed source eruption. Substituting a mid-latitude site in the northern hemisphere instead of the low-latitude site of Babuyan Claro, for example, would be expected to reduce the reconstructed mass by at least 25% (Zielinski 1995; Toohey and Sigl 2017). The Babuyan Claro example is therefore distinct from other examples of misattributed eruptions where a climate impacting stratospheric sulphate aerosol has been produced, but where the change in source location involves only a small distance at similar latitude. For example, a VEI 5 eruption in 1641 (GVP 2013), which produced an even larger Greenland sulphate peak than that in 1831 (Zielinski et al. 1994; Sigl et al. 2013), had previously been attributed to Awu, in Indonesia, but Delfin et al. (1997) established that it had taken place at Parker volcano, also in the Philippines, only c. 300 km away. The 1831 eruption of Babuyan Claro is regarded as one of the most significant volcanic climate forcing events of the nineteenth century (Zielinski 1995; Arfeuille et al. 2014; Toohey and Sigl 2017). However, our analysis shows that there is no reason to believe that there was an eruption of Babuyan Claro in 1831. The historical account which has long been treated as the single primary source for this eruption, Meyen (1835), in fact provides no evidence of any such eruption. The records of an 1831 eruption of Babuyan Claro in the present-day literature can be explained as the result of Von Buch’s (1835) and Sapper’s (1917) mistaken assumptions about this account. We therefore suggest that the 1831 eruption of Babuyan Claro is a false event and that its records in the present-day literature are erroneous, including the VEI of 4? listed in the GVP database (GVP 2013) and the Magnitude of 4.7 listed in the LaMEVE database (Crosweller et al. 2012). The literature on false or misattributed eruptions is comparatively sparse. Two recent examples are Guidoboni (2010), discussing an example dating to 1198 which had been assigned a VEI of 1 and the above-discussed Delfin et al. (1997). The Babuyan Claro example therefore represents a significant further example of recent date and large magnitude. In the absence of a historical eruption with a VEI ≥ 4, the hazard assessment of Babuyan Claro volcano will have to be re-evaluated and, for example, the inclusion of Babuyan Claro in the LaMEVE database will no longer be warranted. At least one alternative eruption, potentially at a mid- or high- latitude site in the northern hemisphere and with a high sulphur yield, will have to be identified as the source of the 1831 stratospheric sulphate aerosol. Such a change of source eruption could have quantitative consequences for the correct representation of the 1831 stratospheric sulphate aerosol in climate models. 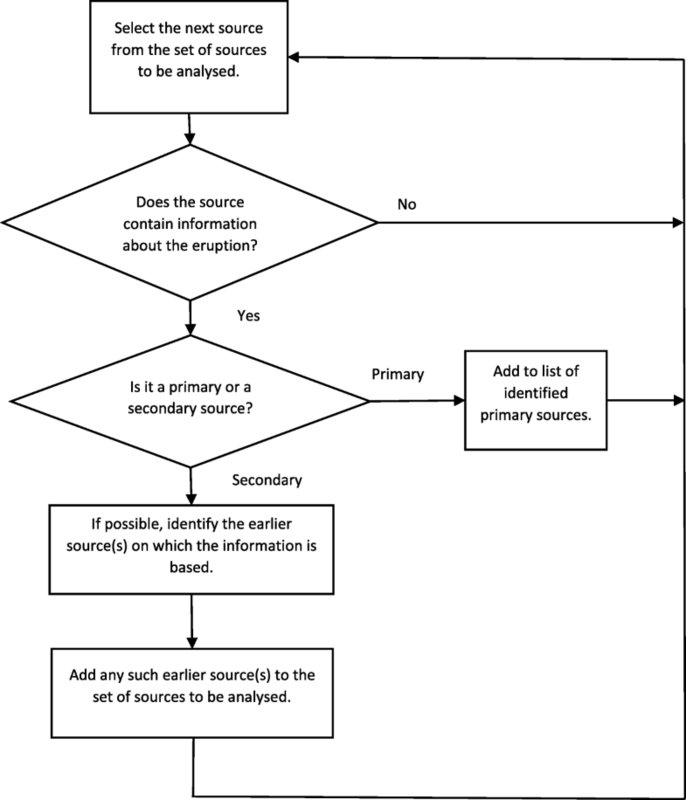 The Babuyan Claro example thus emphasises the potential for misattributed eruptions to have a significant impact on both volcanology and climatology and reinforces Guidoboni’s (2010) call for the careful analysis of primary historical sources in volcanology. Whether one of the remaining historical eruptions listed for 1831 in the GVP database could be the source or whether an as yet unknown eruption is responsible is the subject of continuing work. We would like to thank Montse Manzano Fernandez for providing the translation of de Salazar (1742), Ben Andrews (Smithsonian Institution) for information regarding the GVP database and Danielle Charlton (UCL Hazard Centre) for assistance with the preparation of Fig. 3. We would also like to thank Russell Blong, an anonymous second reviewer and Christopher Newhall for the improvements to the manuscript which resulted from their comments. This work was self-funded (CG). CG carried out the analysis presented in this study and drafted the manuscript. CK and SE critically reviewed the manuscript and provided guidance and expertise on the volcanological context. All authors read and approved the final manuscript. Arago F (1832) Notices scientifiques par M. Arago: des Comètes en général, et en particulier, de la Comète qui doit reparaître en 1832 et dont la révolution Est de 6 ans 3/4 in: bureau des longitudes Annuaire pour l’An 1832. Bachelier Père et Fils, Paris, pp. 156–288. Available at: http://gallica.bnf.fr. (Gallica, Bibliothèque nationale de France). De Salazar V (1742) Historia de la Provincia de el Santissimo Rosario de Philipinas, China y Tunking, de el Sagrado orden de Predicadores: tercera parte. Manila. Available at: http://bdh.bne.es. (Biblioteca Digital Hispánica, Biblioteca Nacional de España). Fuchs C (1865) Die Vulkanischen Erscheinungen der Erde C. F. Winter’sche Verlagshandlung, Leipzig & Heidelberg. Available at: http://books.google.com. Global Volcanism Program (GVP) (2013) Volcanoes of the World, v. 4.4.1. (Venzke, E (ed.)). Smithsonian Institution. https://doi.org/10.5479/si.GVP.VOTW4-2013. Accessed 22 Sept 2015. Kiessling J (1888) Untersuchungen über Dämmerungserscheinungen zur Erklärung der nach dem Krakatau-Ausbruch beobachteten atmosphärisch-optischen Störung. L. Voss, Hamburg. Available at: http://www.e-rara.ch. (ETH-Bibliothek Zürich). PHIVOLCS (2008), Active Volcanoes. Philippine Institute of Volcanology and Seismology. http://www.phivolcs.dost.gov.ph. Accessed 12 Mar 2015.